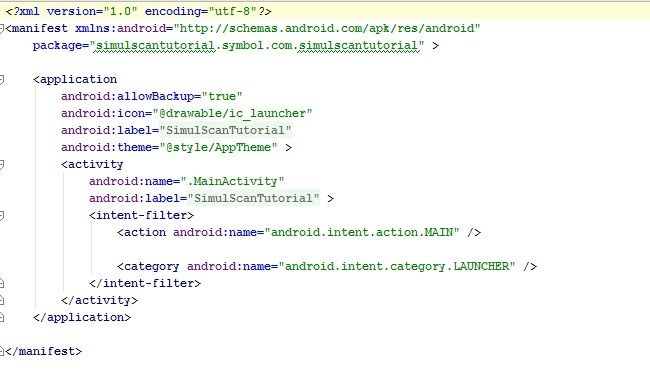 This guide will walk you through creating an EMDK For Android application that will use SimulScan APIs introduced in EMDK V 3.1, to capture critical data from documents. This facilitates capturing fields of interest from a document and converting them into data that an end-user application can use immediately at the point of transaction. Barcode - Productivity gain by decoding multiple bar codes read with a single trigger pull. OCR (Optical Character Recognition) - Automated data entry with character recognition [OCR]. OMR (Optical Mark Recognition) - Simplified workflow exceptions with checked mark recognition [OMR] and Signature presence detection. We discussed SimulScan API is used to capture above mentioned different types of data from documents. But what types of documents are these? Well, these documents are treated as templates where you know the position of the data that you need to capture. You mark positions of the data of your interest on a template and once you capture the document, SimulScan API would access to data at the positions you mentioned on the template. You can use an existing template or create your own template depending on the data that needs to be captured from the document. 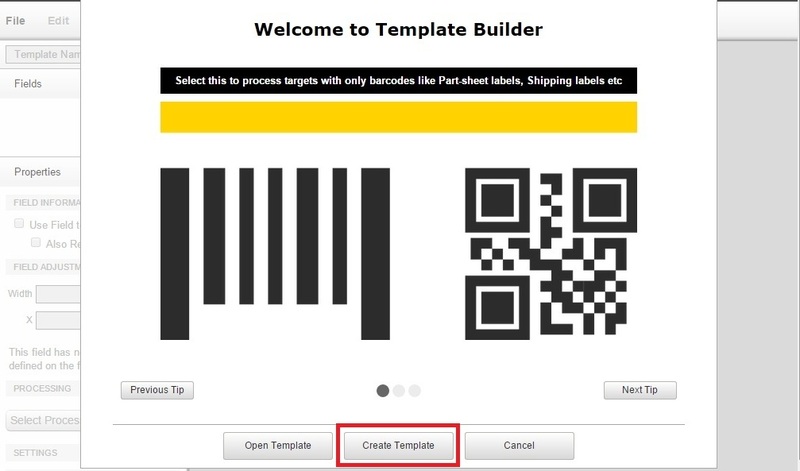 Click here to login using your partner credentials and create your own template by uploading image of your form. 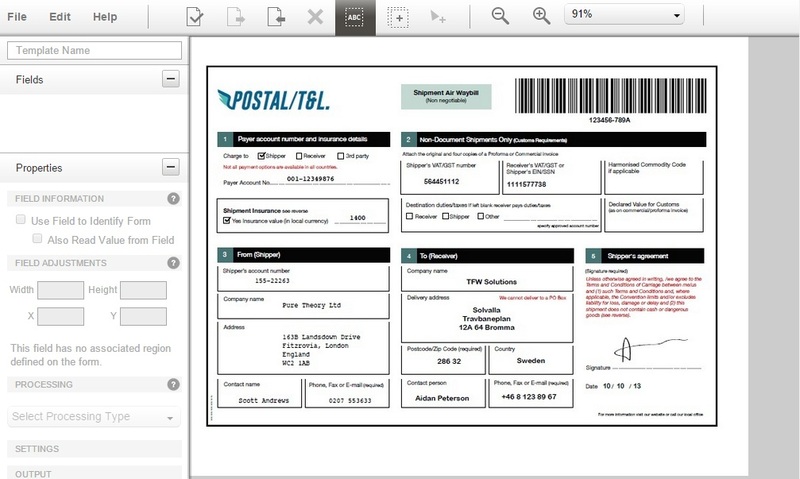 Once you upload the image of your form, you can mark the fields that needs to be captured and create a new template. 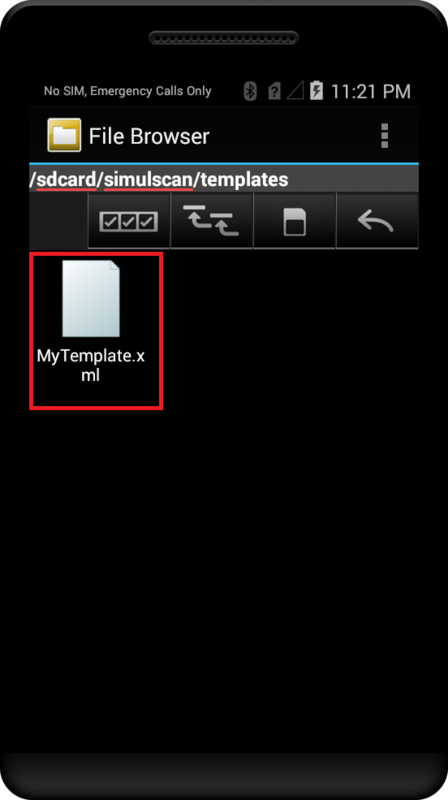 Now, if you load this template in your SimulScan tutorial application and capture image of the document, it would automatically recognize fields of your interest on the template that you marked, capture only those fields and populate them on UI. 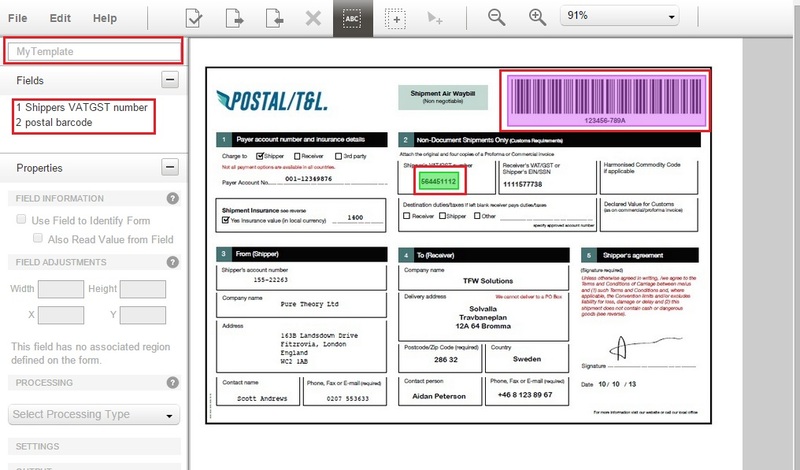 The above document has various fields having text, barcode, signature that could be needed to capture and display on UI for an application repeatedly. 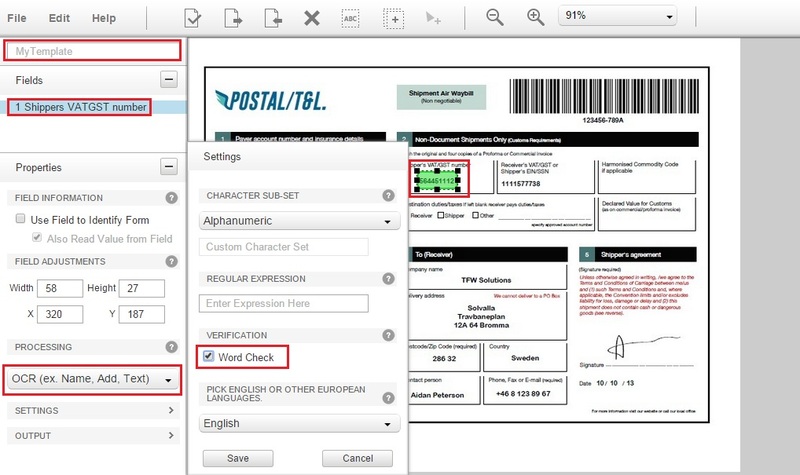 Suppose, we need to capture two highlighted fields through our application, which contains barcode and characters. If the required number of fields are more, it could be painful to capture each and every field individually, decode it and populate on UI. 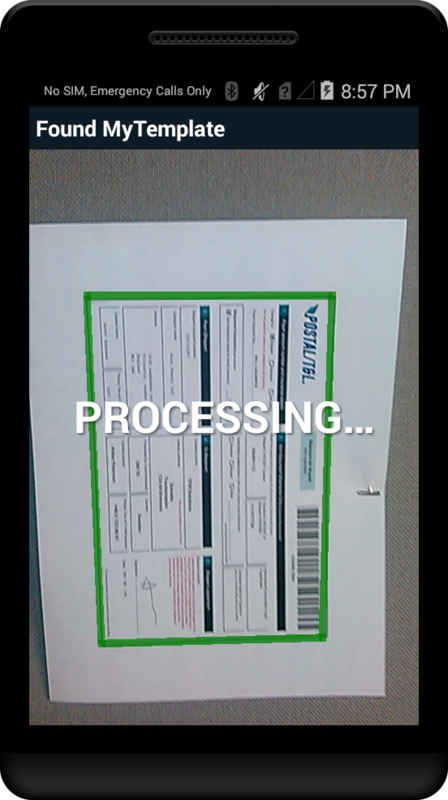 SimulScan API could come really handy here as it captures upto 10 barcodes in less than one second. So we will now create a tutorial that would use above form image to create a template and use this template to capture marked fields from that document populating on UI using SimulScan APIs. This will let you know how to create your own template for capturing different fields from any particular document. SimulScan is currently supported on TC55 Rev B KitKat and TC75. Note: As SimulScan is built into the OS image in the above devices, download the latest OS from SupportCentral. Log in using your partner credentials to https://simulscan.zebra.com. Click on "Create Template" button. You could see different document types based on your needs. 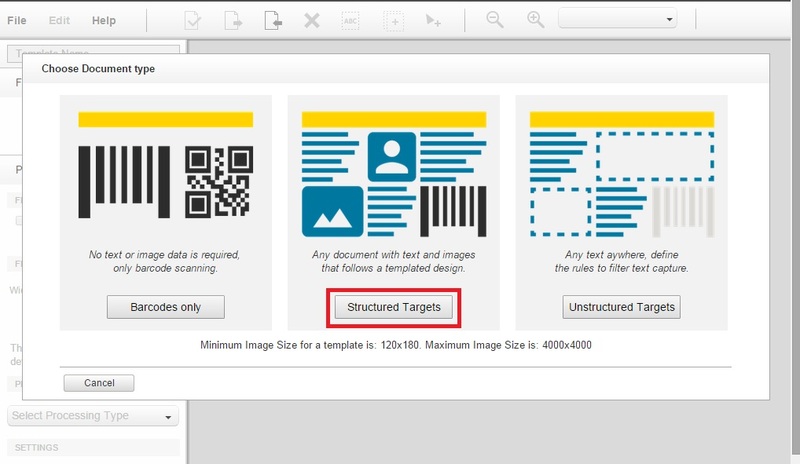 Since we already have a document format that contains barcodes and characters, click "Structured Targets" button. Provide the "Template Name" at the top left corner (Ex: MyTemplate) and press "enter". 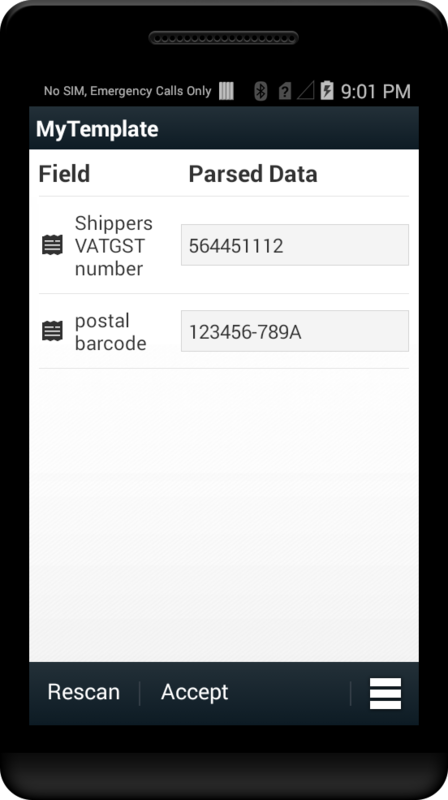 Shipper's VAT/GST number (Provide "Shippers VATGST number" as the field name). Select OCR processing with word check. 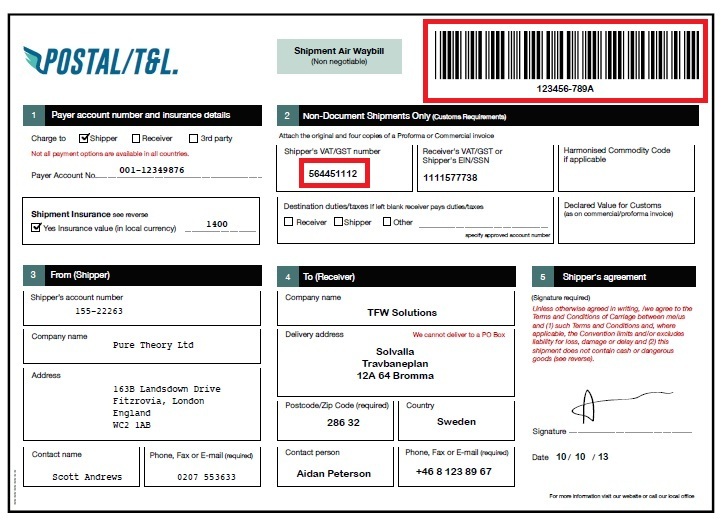 Barcode at the top right of the document (Provide "postal barcode" as the field name). 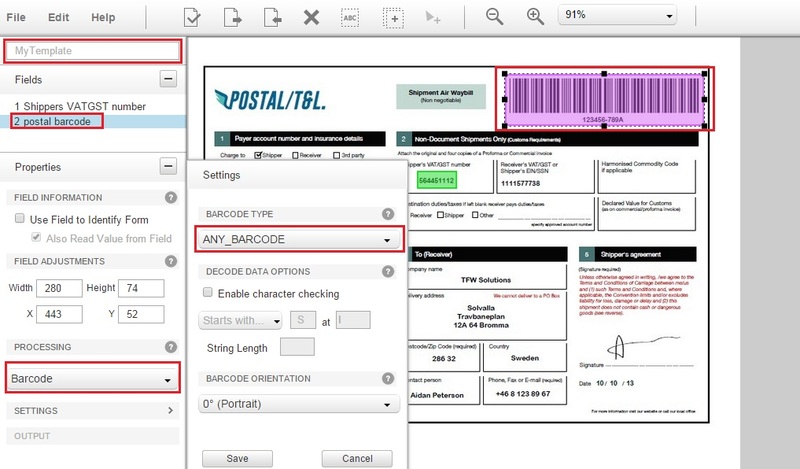 Select Barcode processing with any barcode type. Click "File" and "Download Template" to download this created template on your machine. 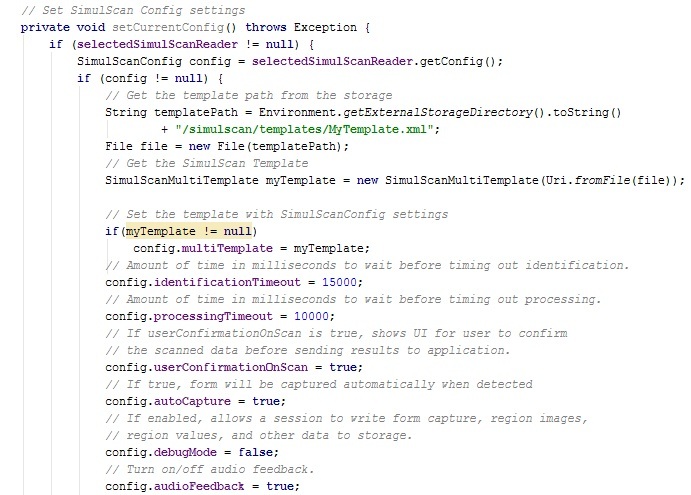 Downloaded template is an xml file (Ex: MyTemplate.xml). 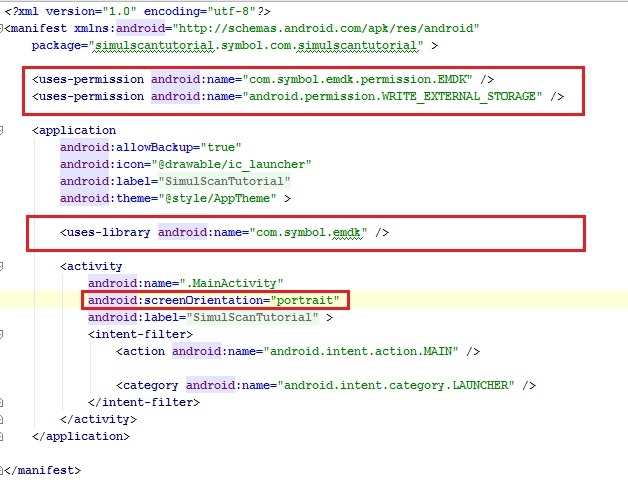 Put this template file under "/sdcard/simulscan/templates" on your device so that our Android application can detect this template. 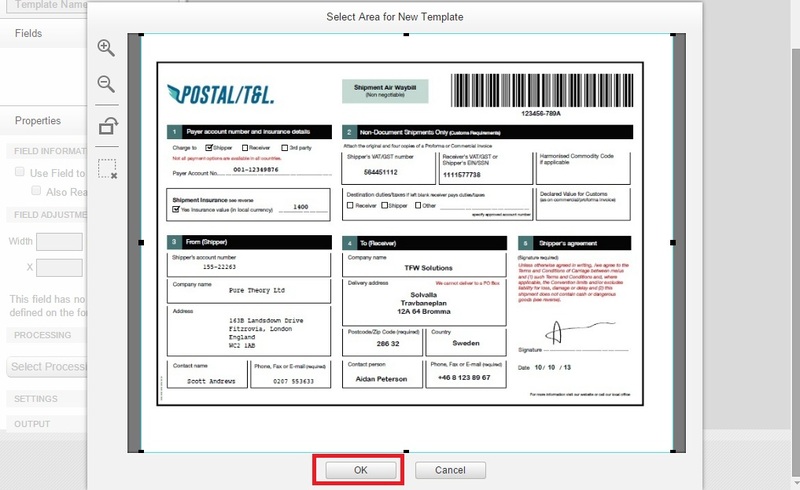 This is how you can create your own template to capture any field on any document. Request a trial license from Product Manager (Andrew.Knight@zebra.com). Copy the License.xml file received from the licensing server to a location on the sdcard. Upgrade the TC55 or TC75 software to the latest [2.46 and above for TC55, 0901 and above for TC75]. Launch the Settings app -> About Phone –> Legal Information -> Symbol Licenses -> Install a license ? -> Yes -> point to the file on the sdcard. This will install the license . For mass deployment, end customers would need to use StageNow. Note: Post your queries on SimulScan Launchpad page so the team can assist you at the earliest. Note: Provide "SimulScanTutorial" as the project name for this tutorial. Then set orientation to portrait mode to restrict orientation by adding following line in the <activity> tag. 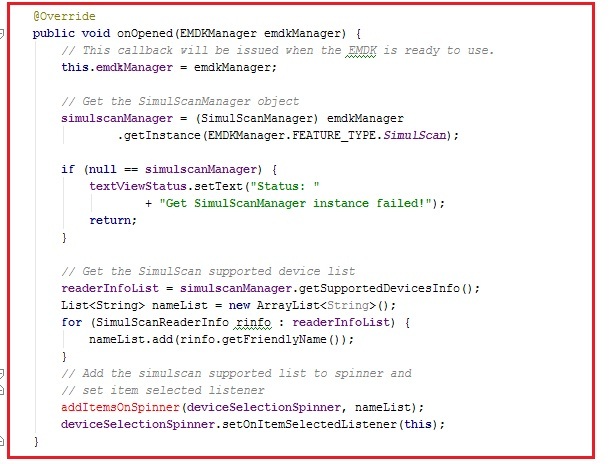 Implement EMDKListener for using EMDKManager. Implement SimulScanReader.DataListerner, which is an interface for notifying client applications when the scan data is available. Override its onData method to receive the scanned data. Implement SimulScanReader.StatusListerner, which is an interface for notifying client applications to notify scan events. Override its onStatus method to receive status of any SimulScan operation that would be performed in the application. Implement View.OnClickListener and override its onClick method to handle on click of buttons. 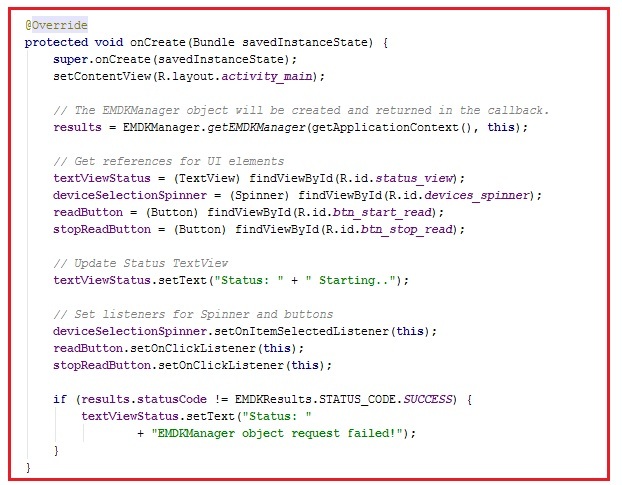 Implement AdapterView.OnItemSelectedListener and override its onItemSelected and onNothingSelected methods for handling spinner. We will now create some global variables to hold the instance objects of EMDKManager, SimulScanManager and SimulScanReader. These variables would be used throughout the code. We will then add some UI elements starting with a TextView to display the status of SimulScan operation. The UI would have a Spinner that would contain a list of SimulScan supported devices. The UI would also have two Buttons to start and stop reading template. 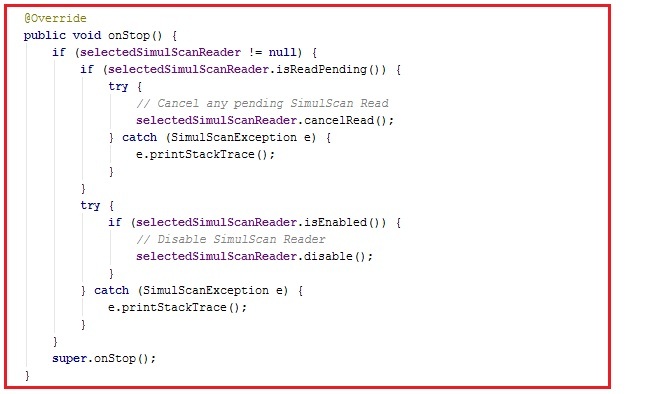 The variables would also have a list (readerInfoList) to hold Simulscan supported device and another synchronized list (simulScanDataList) to hold various data of the scanned template along with an exception (lastException) to catch exceptions if any. // object for holding EMDKResults data. // provides access to physical SimulScan reader device. Now, let us design a simple UI that has UI components explained above. In the onCreate method, we take reference of UI elements that are declared in "res/layout/activity_main.xml" in order to use them in our Activity and add their respective onclick listeners. We then call getEMDKManager so that the EMDK can be initialized and checked to see if it is ready. Get EMDK Manager and SimulScanManager objects in the onOpened method and update the StatusView TextView. Now get the list of SimulScan supported devices, iterate over it and set this list to the spinner that we have added in the UI followed by adding listener for this spinner. You will see an error as we have not added addItemsOnSpinner method. So lets add it now. This method would basically get Spinner and list of SimulScan supported device as arguments. It would add this list in an adapter and set that adapter into spinner to display this list on UI. The user would select any SimulScan supported device from the list in spinner. So we need get that SimulScanReader and initiate it. Since the user would select it from the spinner, we need to add our code in onItemSelected method of the spinner that we have already overridden. 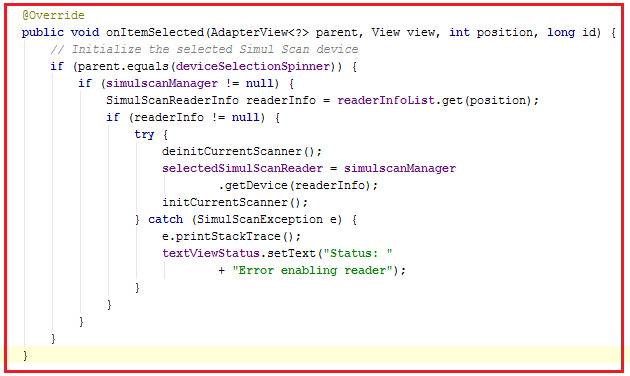 So this code would get user selected SimulScanReaderInfo from the spinner and pass it to simulScanManager.get to get the user selected SimulScanReader object. This SimulScanReader object represents the current SimulScan Reader device selected by user from the spinner of simulscan supported devices. We would then initialize or deinitialize this SimulScanReader using respective methods. Lets add initCurrentScanner and deinitCurrentScanner methods to initialize and de-initialize the current scanner respectively. This would also get read of errors. The initCurrentScanner method would add data and status listeners to the current scanner (SimulScanReader device) to receive scanned data and status notifications respectively. 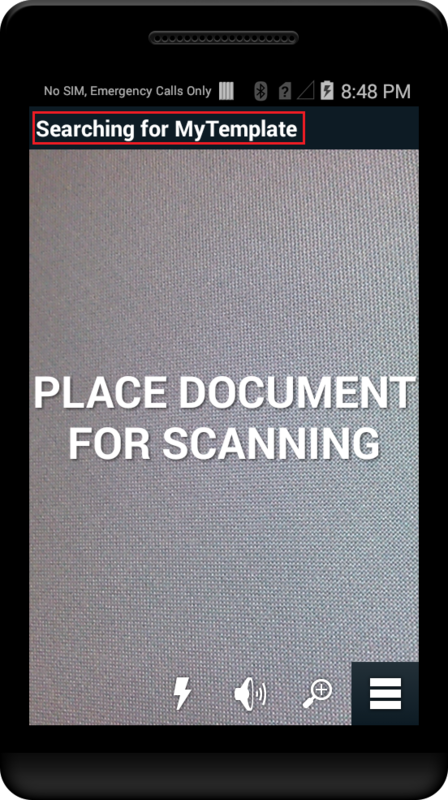 Finally it would enable the scanner. The deinitCurrentScanner method would cancel any pending reads and then disable the current scanner (SimulScanReader device). It would then remove data and status listeners. // Amount of time in milliseconds to wait before timing out identification. // Amount of time in milliseconds to wait before timing out processing. // the scanned data before sending results to application. // region values, and other data to storage. // Turn on/off audio feedback. // Turn on/off haptic feedback. // Turn on/off LED feedback. 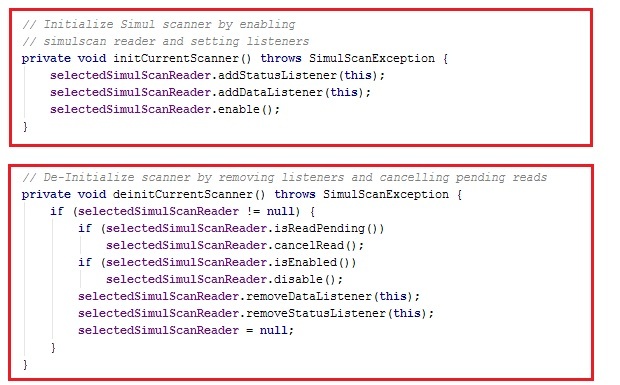 In this step, we would add methods that would actually start (readCurrentScanner) and stop (stopReadCurrentScanner) reading templates with the help of SimulScanReader instance for the current scanner that we created. So lets add readCurrentScanner method first. We would now add the code in onClick method that is overridden for the "Start" and "Stop" buttons in the UI that would call readCurrentScanner and stopReadCurrentScanner methods to start and stop the template reading respectively on click of these buttons. 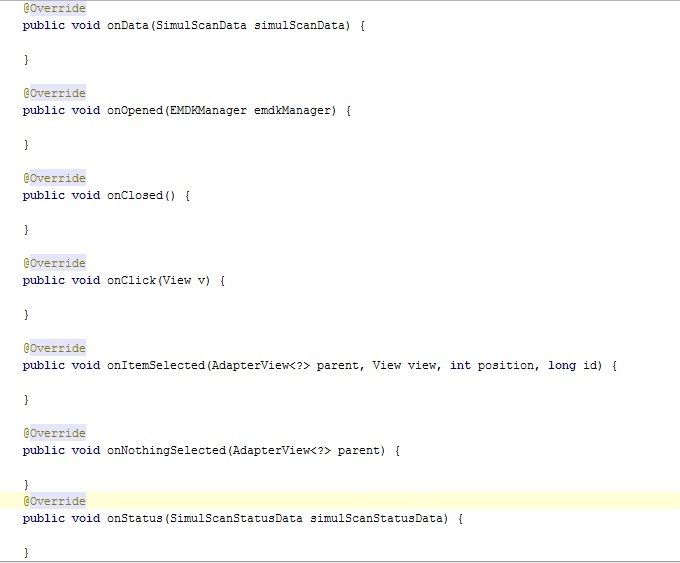 Add following code in the onClick method. You can see the code and understand that if "readButton" button is pressed, it calls readCurrentScanner method to read template. 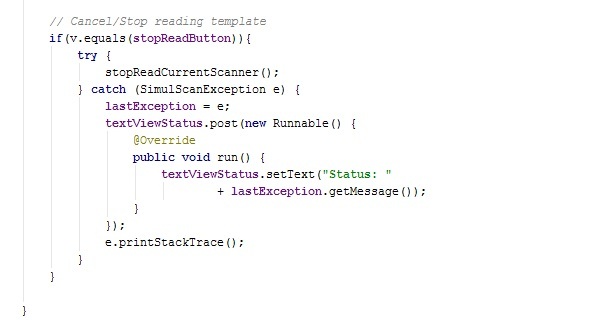 If "stopReadButton" button is pressed, it would call stopReadCurrentScanner method to stop/cancel reading the template. The status would be updated on "ViewStatus" text view in both the operations. Once we start scanning a template, we would get the template data in onData and status while executing scanning operations in onStatus methods respectively that have been overridden already but not handled yet. So lets handle them starting with onData method, which is a callback method upon data availability. onData method contains SimulScanData object that has the scanned data of a template. We would add this object to simulScanDataList that we had created to use it while displaying data. The status of any SimulScan operation is received in onStatus method, which is a callback method upon scan status event occurs. 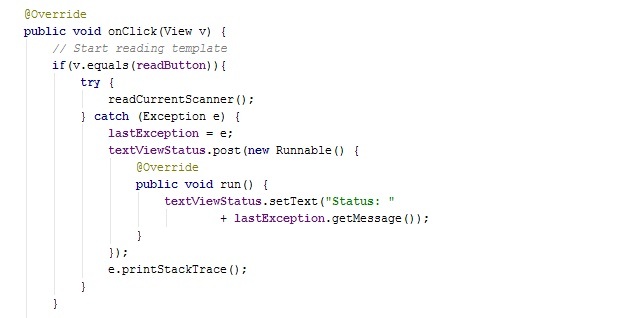 We would update the "StatusView" TextView based on the status on UI thread using following code in onStatus method. You can see an error as we have not created a class StatusDataRunnable implementing runnable to update "StatusView" on UI thread. Lets do that by creating a class implementing runnable and taking SimulScanStatusData as an argument in constructor. simulScanStatusData.getState() would return you the current status of scanner, which would be updated on "StatusView" TextView. 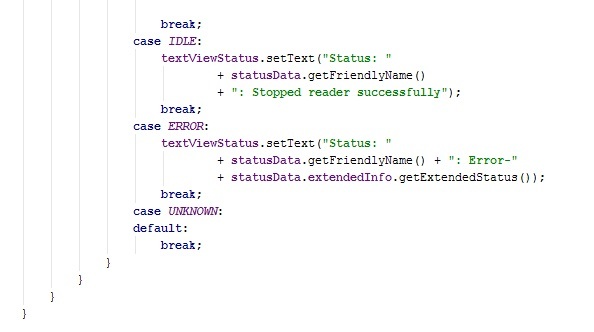 + statusData.getFriendlyName() + ": Error-"
Finally, we would update "StatusView" TextView in the onClosed method for any abrupt closing of EMDK using following line. That's it!!! 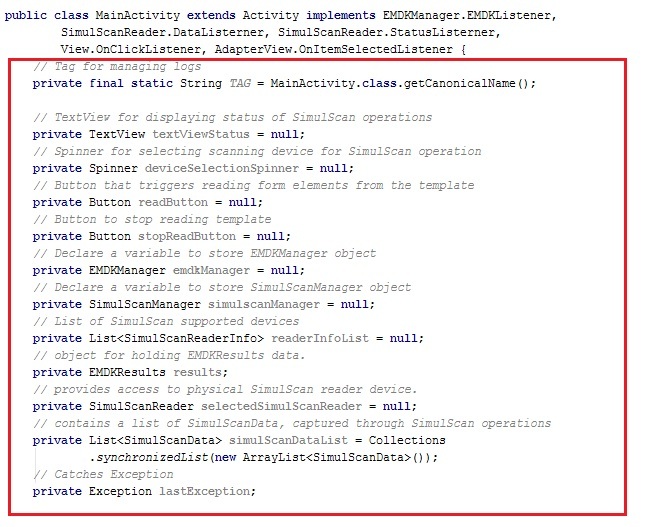 We are done with all the coding and configuration part that will let us scan the template stored in sdcard and display fields that we marked in the template, on Symbol device UI using SimulScan APIs introduced in EMDK V 3.1. Now let us run the application. 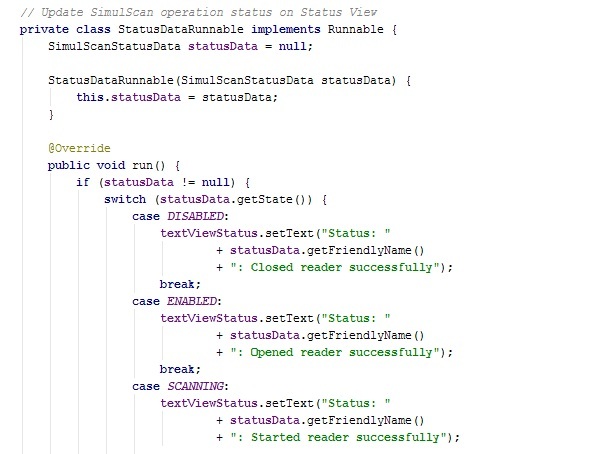 You can see a message on the "StatusView" that indicates EMDK Manager has been successfully initialized and reader has been opened successfully. 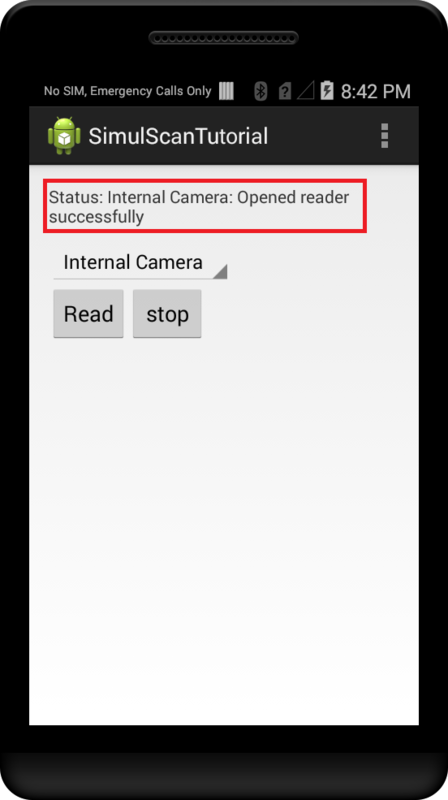 You can select different SimulScanReader device by clicking on Spinner but as of now TC55 supports only Internal Camera for SimulScan. Hence its the only device in the spinner. 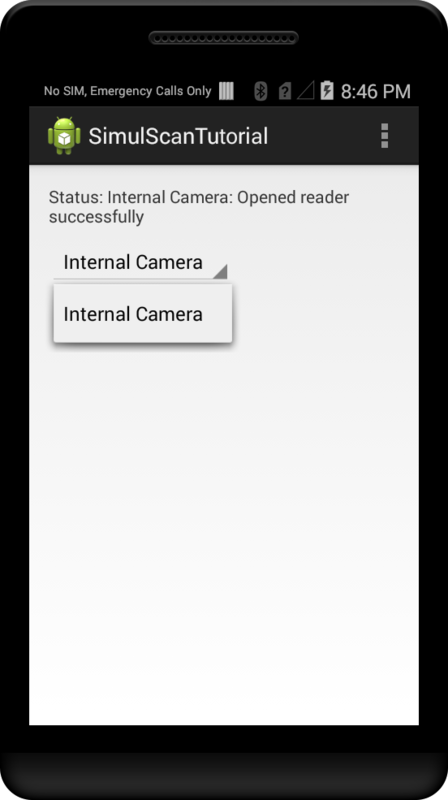 Once selecting Internal Camera as SimulScanReader device from the spinner, click read button. It opens the Internal Camera. You can see that its searching for "MyTemplate" that we had set. Place Internal Camera above the printed copy of "MyTemplate". It would process the template by outlining it and read the marked fields in the template viz. 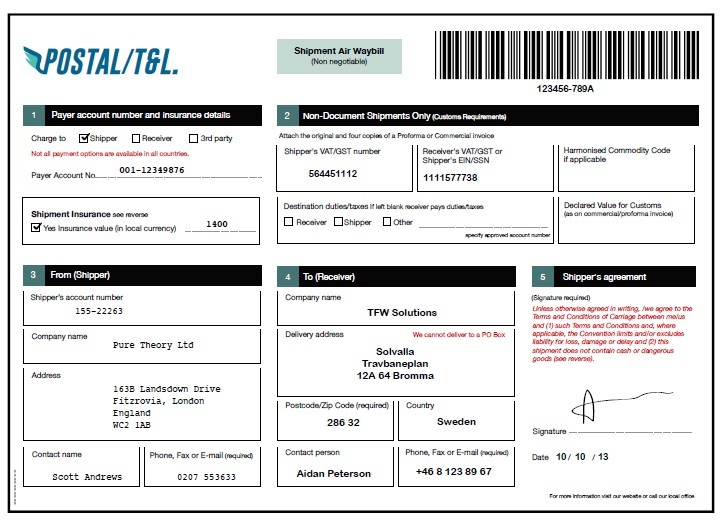 Shipper's VAT/GST Number and barcode at the top right. 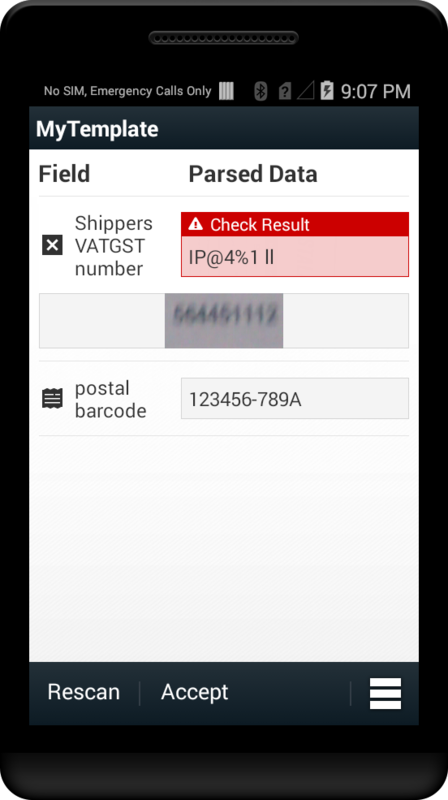 You can see that SimulScanReader device has successfully scanned and parsed the Shipper's VAT/GST number and barcode fields and displayed them on UI. You can press "Accept" button at the bottom to use these values in your application. If the SimulScanReader device is not sure about the correctness of scanned fields, it would display them in red background. It means you need to re-scan the template by pressing "Rescan" button at the bottom left. This illustrates how to access critical fields from a document using SimulScan APIs by creating its template from the Template Builder. Place the template in the SD Card before accessing it from the application.